Homemade Tostadas are loaded with veggies and Mexican flavors for an irresistible healthy recipe. 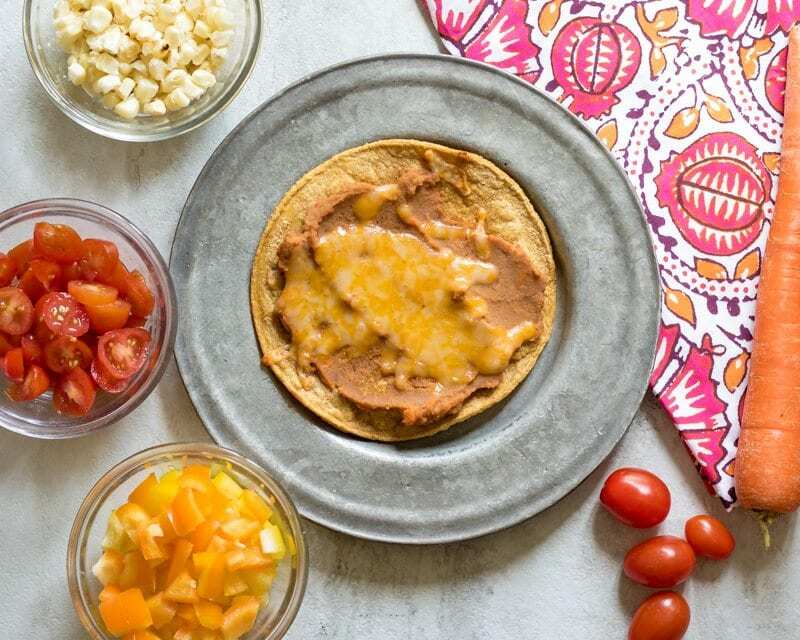 These Baked Tostadas are made with crisp corn tortillas, refried beans, cheese, and fresh vegetables. This kid-friendly meal packs a huge dose of vegetables in each serving. Baked Tostadas are a fabulous way for picky kids to enjoy their veggies, as are Bean Burritos, Cheese Quesadillas with hidden Veggies, and Sweet Potato Burritos. If you like nachos, you will love tostadas. A tostada is crispy tortilla, topped with refried beans and all the toppings of nachos. They are SUPER easy to make at home, and a delicious vessel for all of your favorite Mexican toppings. 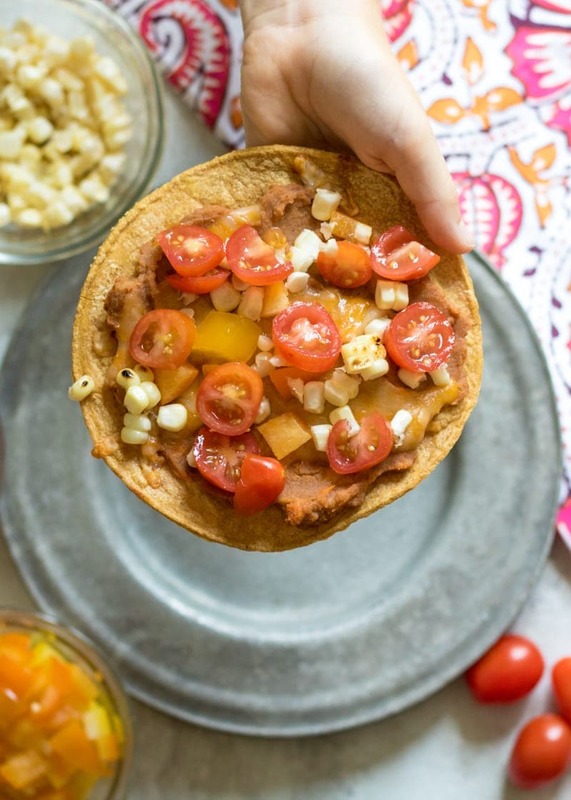 My homemade tostadas are made with crispy baked corn tortillas, refried beans, and cheese. They are incredibly simple to make–even young kids can make these at home. Did I mention you can have these tostadas on the table in less than 20 minutes? And that the whole family LOVES them? 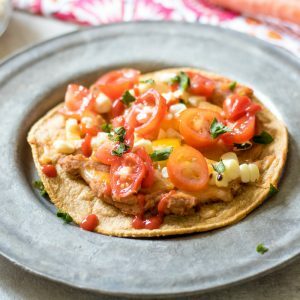 Making these easy tostadas PERFECT for busy nights! 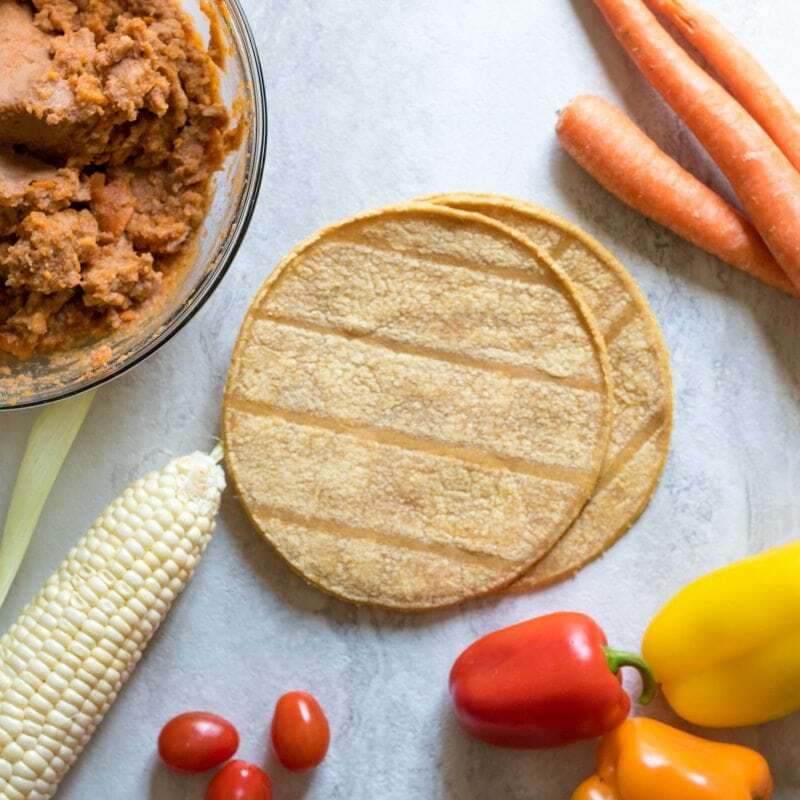 I love to add carrot or pumpkin puree to my refried beans as well for a boost of veggies, but that is totally optional. Most totadas are deep fried, but they are just as tasty and crispy when baked. Plus, they are easier to make! Brush each tortilla with oil on each side. Bake for 8-10 minutes at 400 degrees until crisp. Mix together refried beans, carrot puree (if using), and taco seasoning together. Spread bean mixture evenly over baked tortillas and then top with cheese. Return to oven until cheese is just melted. I like to use corn tortillas for these tostadas because it is traditional in flavor and gluten-free. However, flour tortillas will work as well. Use any veggies to top your tostada that you like. My son loves to add corn salsa and fresh salsa. My daughter loves the tomatoes and corn. I love it all! You can also toast the tortillas over the stove or on the grill instead of the oven. Just watch carefully. Feel free to add taco meat or shredded chicken to your tostada as well. Brush each tortilla with oil on each side. Bake for 8-10 minutes until crisp. In the meantime, mix the beans, carrot puree (if using), and taco seasoning together. Spread bean mixture evenly over baked tortillas and then top with cheese. Return to oven until cheese is just melted. Top with corn, peppers, tomatoes, lettuce, and cilantro and hot sauce as desired. **To make carrot puree, boil 1 pound chopped carrots until tender. Blend carrots with 1/4 cup cooking liquid until smooth. 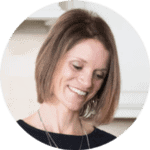 Hi, I am Kristen, creator of A Mind "Full" Mom. I believe that making a wholesome family meal does not need to be hard or expensive! I love nothing more than to share with you delicious solutions for your hungry family. Wow, fabulous post ~ shouldn’t they teach this stuff in school? I love your lettuce head shot! I like a tostada, I like to think of it like a burrito..but it is flat so all the stuff is just there on top. LOL!!! Never thought of it like that. But I can see that! Yes, a perfectly healthy lunch for sure! Thanks Kaitie! My kids had them them devoured in NO time. Great meal for kids! Thanks for the inspiration! These tostadas look amazing!! I want to marry them!!! LOL!!! There would be no back-talk or compromise with these babies! I love a quick and delicious, healthy meal and this is definitely one of those! We made these yesterday and loved them. They’re so flavorful and everyone is obsessed! I love hearing that Shadi! 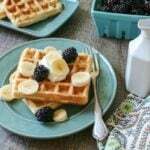 It is such an easy recipe for your family to enjoy too! 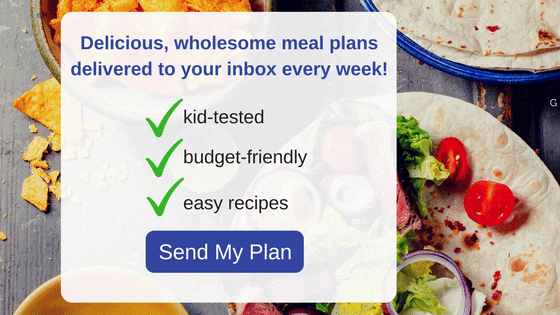 Family-approved meal plans delivered to your inbox every Sunday!